Mint tea is one of the world's favorite types of tea. It is cooling and warming at once, and utterly refreshing. I've posted mint tea recipes before, but never like this: every one of the tea blends below can be made in five minutes or less, and (because they're made with dried herbs) they can be used for months and months to come. Below, I've listed ten mint tea blends that will rock your herbal world. From super-soothing (the "Day Spa" blend) to a bold wake-up tea (roasted yerba mate with mint), this collection of recipes shows the versatility of mint and highlights all its best traits. For each ratio listed below, simply measure the dry herbs into a clean bowl or large, clean jar and stir or shake gently to mix. Then, seal your homemade herbal deliciousness in a clean jar and store it away from light and heat. When you're ready to drink your blend, measure about one tablespoon per cup (if the leaves are pretty much whole) or one teaspoon per cup (if the leaves are broken up a lot) and steep in freshly boiled water for five to ten minutes (unless otherwise noted). These blends are great for gifts or for your own personal tea stash. No matter how you choose to use them, remember to make them with joy and to love every sniff of that fantastic mint aroma! Note: You can use peppermint (which is known for its health benefits), or spearmint, chocolate mint, lemon mint, wild mint or other types of dried mint, depending on your preference and the individual recipe. Peppermint has a sweeter taste than spearmint (which can be 'sharper' in flavor). As the names suggest, lemon mint and chocolate mint taste like lemon and chocolate, respectively. And, now, on to the recipes! I once interviewed a tea business owner who quipped that the only teas spas ever buy are lavender and mint. There's some truth behind the joke! Both herbs are deeply relaxing from the first sniff, and they are ideal for spas, evenings in and other occasions to kick back and relax like you mean it. This easy herbal infusion can be mixed up in advance and prepared with ease on those days when you really need it. If desired, add a bit of dry stevia to the blend or sweeten the brew with honey. Be sure to really breathe in this tea in between sips--the aroma will turn your whole day around. You can make this dessert tea blend with either Houjicha green tea (which has a roasty, nutty taste) or rooibos red tea (which has a woodsy, sweet taste). Both are sublime! 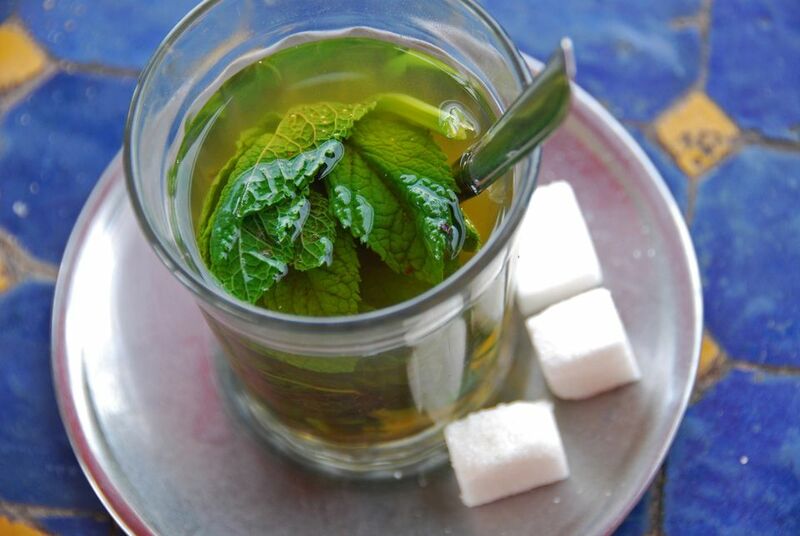 Traditional Moroccan mint tea is made with fresh mint leaves. However, this recipe offers up a minty, bold flavor of Moroccan mint all year without the need for out-of-season herbs. It also includes lemon verbena, an herb that is used in more old-fashioned Moroccan mint tea recipes (as are fresh orange blossoms and wormwood). Serve with ample sugar or honey if desired. Yerba mate is a naturally high-caffeine herb--perfect for jump-starting your mornings. Roasted yerba mate has a toasty flavor that goes well with mint, and mint has been enjoyed in yerba mate infusions in South America (yerba mate's homeland) for many, many years. This blend balances the two bold flavors well. In summer, try the brewed herbal infusion over ice. It's also great with a squeeze of lemon or a dab of honey. Like mint and chocolate, mint and lemon are a natural match. This healthy herbal blend combines dried mint with two lemony tasting herbs. Try this tea with a wedge of fresh lemon for extra flavor. Some people also like to add honey to their tummy-soothing teas. It often helps, too! Yes, mint is great with all sorts of bold flavors. But as we saw with "Day Spa" (the first recipe on the page), mint goes equally well with certain floral flavors, too. This blend is a great example of that. It combines mint with rosehips and hibiscus--two especially sweet-tart flowers that balance out the fresh flavor of mint nicely. Add a little dry stevia leaf if you like, or sweeten to taste after you brew each cup. Nettle leaf and raspberry leaf have both been shown to aid in deeply nourishing pregnant women and in reducing problems that can occur during pregnancy and labor. Infuse this blend overnight in a Mason jar, then strain out the leaves and drink it the next day. As an aside, I suggest opting for organic teas and herbs whenever possible and would like to underscore the importance of organic herbs for expecting mothers. Even if you never chose organic before, please consider it now. Enjoy with organic honey or other sweeteners if desired. Nettle is a seriously magical herb. It is incredibly strengthening, and I love it in combination with bold, bracing mint for that reason. Infuse for five minutes or longer (even overnight) for a caffeine-free boost in your teacup. Add a little honey if you like. It will put even more pep in your step! Technically two blends, these are super-cooling herbal infusions that are great for colds, sore throats, and fevers. Steep for longer than most brews--10 to 20 minutes is ideal. For sore throats and coughs, add a little honey (preferably organic, local honey).